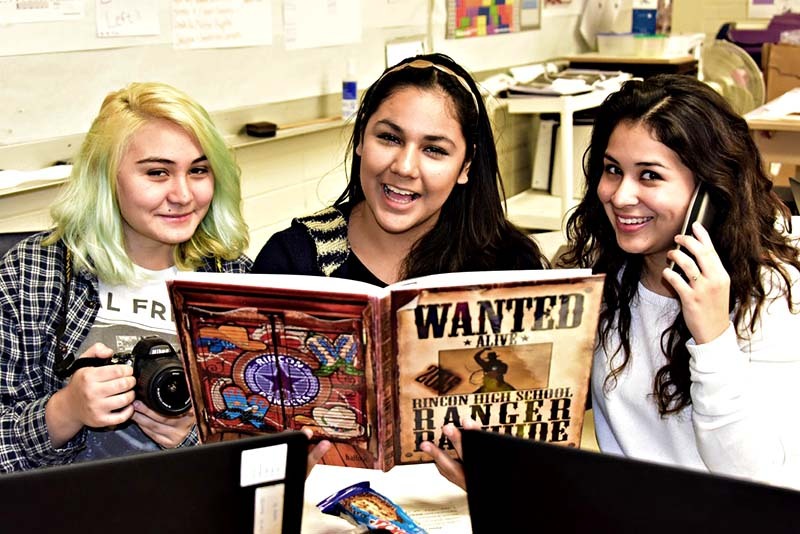 The Rincon Rawhide Yearbook leadership staff are responsible for tweeting, Instagramming and Facebooking every event that affects Rincon High's entire student body. The leadership staff consists of the editor-in-chief, senior Guadalupe Burruel; photo editor and Photoshop queen, senior Cheyenne Sevy; and business manager, sophomore Maricruz Pedroza. Not only do they publicizing events, and they make sure everybody on the Ranch keeps up with athletic scores, fine arts events and student gatherings. These three have their finger on the collective Ranger pulse! Maricruz Pedroza: I like to stay busy and manage money and paperwork. Guadalupe Burruel: I love that we can bring our own food. Cheyenne Sevy: I like being able to work on something my classmates will look back on for years.